2016 Hyundai i20 1.0 T-GDI 100 review | What Car? The Hyundai i20, in petrol form, has previously come within a whisker of toppling our class favourite and 2015 Car of the Year, the Skoda Fabia, due to its keen purchase price and PCP costs, spacious interior and refinement. However, one area where the i20 has lagged behind is in the engine department. Although quiet, even the most powerful 1.4-litre petrol motor feels sluggish. While this may not be an issue for low-speed town driving, it means the i20 feels well out of its depth when you get up to motorway speeds. An update for 2016 brings a new 1.0-litre turbocharged petrol engine, along with some additional equipment. At 99bhp, the 1.0-litre engine has the same amount of power as the 1.4 but it is more flexible across a wider range of revs. Not only is the i20 now faster than before, it’s also cleaner and more fuel efficient. Claimed CO2 emissions duck under the 100g/km mark while the official fuel economy figure is up to 65.7mpg. What is the 2016 Hyundai i20 1.0 T-GDI like to drive? Compared to the breathless 1.4-litre it replaces, this new turbocharged 1.0-litre engine feels surprisingly rapid; it’s nearly a second faster than the 1.4. As you’ll find with many of these downsized engines, there’s a brief pause before that power is available but you soon learn to drive around this. This is particularly easy given that there’s plenty of pulling power from less than 2000rpm. 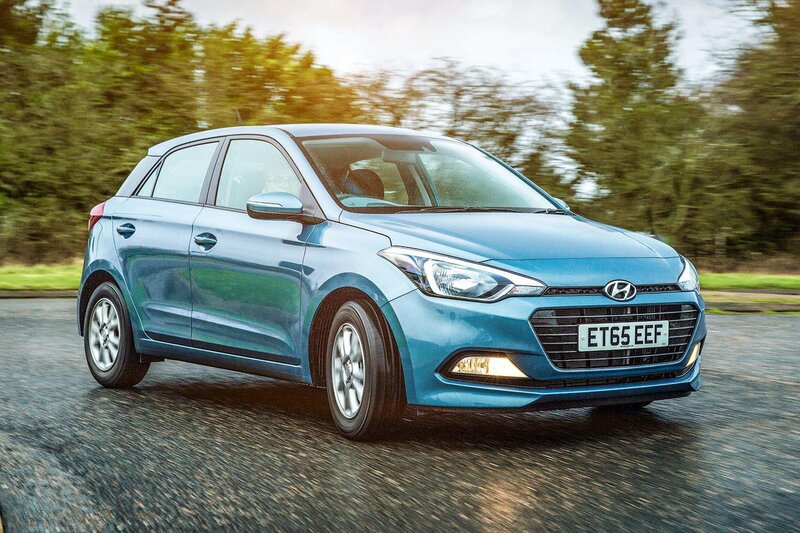 Even at motorway speeds in top gear, you won’t find yourself frantically changing down as you approach hills; the i20 will happily stay in fifth gear and slog away. It would be even better with a sixth gear to help keep revs a little lower for a more relaxed cruise, though. While performance has improved, refinement has taken a bit of a hit. You can feel a buzz through the pedals from the three-cylinder engine and it can sound boomy when pulling from low revs. At intermediate revs, it smoothes out but then becomes quite loud when pushed hard. The rest of the driving experience is much the same as before. The i20's suspension remains fairly firm, so it corners flatly but with none of the fun of a Ford Fiesta, mainly because its steering feels quite vague. Sharper ridges and shabby surfaces can unsettle the i20, but things improve at speed. There's some wind and road noise at speed, too, but it's no worse than in rivals. What is the 2016 Hyundai i20 1.0 T-GDI like inside? One area the i20 excels in is interior space, with a big boot and plenty of room for rear seat passengers; four adults will fit without issue. In the front, it’s easy to get comfy behind the wheel thanks to plenty of adjustment for both the seat and steering wheel. You’ll also find lots of soft-touch plastics and a leather wheel on higher trim levels such as the SE test car we tried. Less impressive is the omission of a colour touchscreen unless you opt for a model with satellite navigation. While it’s easy enough to control the stereo and Bluetooth through the old-school LCD display and selection of buttons, it does look out of date compared with rivals. However, there's now a wider range of two-tone dashboard colour options, good to know if you were put off by the brown or beige colourways that were previously the only choices. There is more reason than ever to opt for the i20 with its new 1.0-litre engine. While the i20 may not be quite as refined as before, the additional flexibility means it’s happier sitting at 70mph, making it much better for motorway journeys. Although this new engine costs £400 more than the old 1.4, it’s a price that’s well worth paying. In any case, a DAB radio is now included from SE trim, which offsets some of this cost, SE being the lowest level trim available with the new 1.0-litre engine. However, while the i20 has been improved, we would still recommend a Skoda Fabia before it. The Skoda may not be quite as big inside, but it isn't far off. It's also better to drive, will hold on to more of its value and offers a far more modern infotainment system.